Reading the Fantastic Four comics from the start. Issue #318 continues this ongoing tour of the weirder corners of the Marvel Universe, only now that Crystal has left the team, it’s the Fantastic Three. Or… is it? 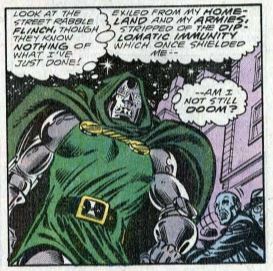 We begin with Dr. Doom, wandering the streets of New York (!) where he attacks and seemingly kills a random passerby. This man, though, is revealed to be the Molecule Man in disguise, having recently moved to NYC. Doom exposits that the Molecule Man’s location is the info that Quicksilver secretly gave him in annual #21. Doom then marches to Alicia’s apartment building and presses the doorbell. Cut to Four Freedoms Plaza, where Ben, Johnny and Sharon talk about how Crystal recently left the team. Johnny says he doesn’t like it, but he’s nonetheless glad to be back with Alicia (who is secretly Lyja the Skrull in disguise). Also, we’re reminded that the portal to the Negative Zone has been moved to inside the building, and the team is readying a Negative Zone expedition to discover the origins of godlike beings called Beyonders (that’s the Beyonders mentioned in an old Marvel Two-in-One story, and not the Secret Wars Beyonder — at least as far as anyone knows at the moment). Johnny gets a call from the building’s lobby, to see Dr. Doom there with Alicia. He dives right into action, flying straight there and starting a fight with Doom. Doom says he’s modified his armor specifically for fighting the FF. Not only is he fireproof, but he fires tiny chemical missiles from his knuckles (!) that manage to put out Johnny’s flame. Ben reminds everyone how Dr. Doom tried to steal the Beyonder’s powers in the first Secret War, and that Doom’s ulterior motive is to retake the Latverian throne from the usurper Kristoff. Doom won’t put up for this, so he escapes FF by using a “time-shift bomb” that puts him two seconds into the future. In this state, he rushes straight to the Negative Zone portal and enters it. 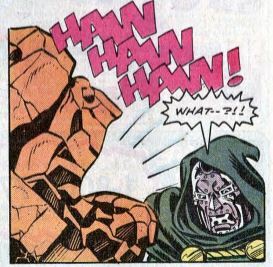 Ben is furious that Doom outsmarted him, but the others are on his side, saying this was merely Doom’s fall-back plan. The FF board a space shuttle-looking ship to enter the Negative Zone. Alicia stays behind to monitor them, using sound alarms and “plasma bubble screens” on the computer. There’s a short scene at a hospital, where we learn the Molecule Man survived Doom’s attack, and his girlfriend Volcana (addressed here as “Miss Rosenberg”) is at his side while he’s unconscious. 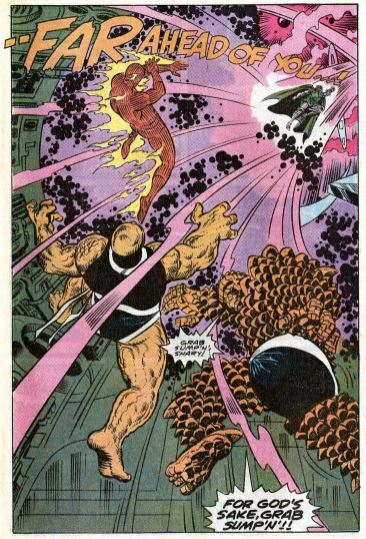 Back in the Negative Zone, the FF fly by the duplicate of Earth made of anti-matter, reminding us that’s a thing in Marvel, and then their ship is attacked by Blastaar the Living Bomb-Burst. He announces that he’s made himself monarch of the Negative Zone. There’s a big fight, in which Blaastar blows the heroes out into space, bombarding Johnny with meteors. 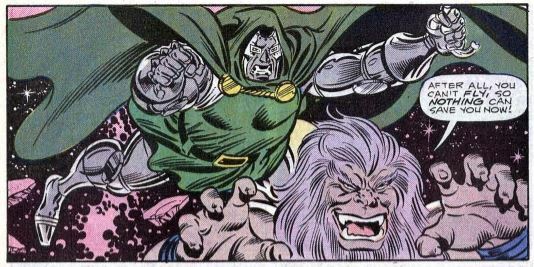 Just when it looks like all hope is lost, Dr. Doom flies up and defeats Blastaar by cutting off his oxygen. Doom and the FF hijack Blastaar’s ship, agreeing that they must work together to find the Beyonders. Clobberin’ time: There’s all this talk about Ben entering the Negative Zone without Reed’s help, but no one mentions how Ben did exactly that in Marvel Two-In-One #75. Sure, he had a bunch of Avengers with him, but he was in a leadership role, teaching the Avengers all about how the Negative Zone works. Flame on: For as much as Johnny has matured and gotten more powerful, he gets easily defeated by both Dr. Doom and Blastaar in this issue. Fantastic fifth wheel: Upon Ben’s laughing in the face of danger, Sharon says she’s “just as committed” to the FF as much as the four original members. 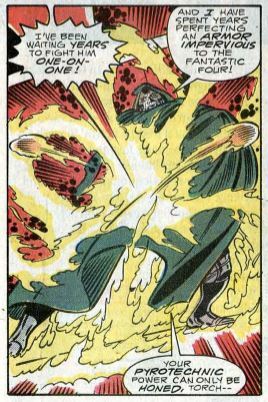 Dr. Doom working together with the FF means we can count this issue as him acting upon his status as an alternate member of the team. The Alicia problem: A lot of this issue hinges on Alicia/Lyja’s uncanny knack for knowing when someone is or isn’t lying. Does this ability come from the fact that Lyja is a shape-changer and spy? 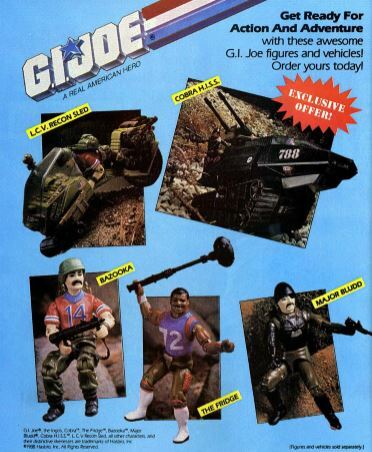 Commercial break: G.I. Joe! Now with the Fridge! 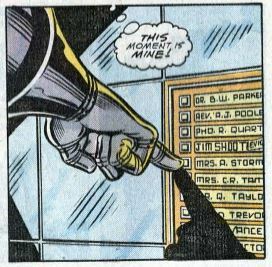 Trivia time: Look closely: When Doom presses Alicia’s doorbell, you can see that controversial former Marvel editor-in-chief Jim Shooter’s name is also listed as living in the building, but with an “evicted” notice next to it. Fantastic or frightful? 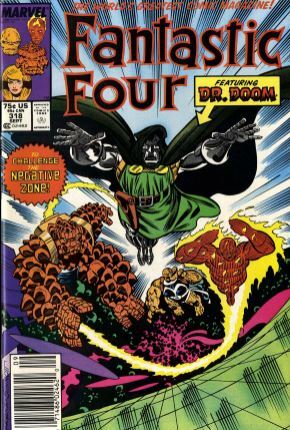 Basically, this issue is only here to set up the next one, but it has a lot hallmarks of what Fantastic Four comics are famous for, namely Dr. Doom’s scheming and Negative Zone weirdness. So, a low-substance issue, but there’s some fun to be had. Next week: Cosmic continuity a-go-go.